Sardinian Knotted Embroidery – A Give-Away! Last week, I reviewed Yvette Stanton’s new whitework book, Sardinian Knotted Embroidery, for you, and this week, I thought I’d follow up with a give-away! I love giving away at least one copy of a new book after reviewing it, but in this case, I’ll be giving away two copies, courtesy of Vetty Creations. And that’s just dandy! That means your chance of winning just doubled! Sardinian knotted embroidery combines counted work with the coral stitch to create textured geometric designs that are usually embroidered in white-on-white, but can also be worked in other combinations, as demonstrated in the various projects in Yvette’s book. It’s an intriguing, different technique, pretty seldom seen in the wider embroidery world since it is a traditional form of embroidery exclusive to a small area of the world. The book makes interesting reading and is jam-packed with instruction and manageable projects – a perfect addition to your needlework library! What do you especially like about Sardinian knotted embroidery? (If you haven’t seen any of it, feel free to check out my review – there are photos!) Is it the fact that it’s counted work? That it’s whitework embroidery? That it is textured? Geometrical? New to you? Fairly obscure and you’d never seen it before, so you’re intrigued? All of the above? None of the above? What grabs you about it and makes you want to try it? 4. Please leave your comment before 5:00 am (CDT, Kansas USA) this coming Saturday, July 26, and on Saturday, I’ll announce the two winners. If you win, you’ll need to contact me, so if you join in, keep an eye out for the announcement on this Saturday. And that’s all there is to it – simple, simple! Now, go forth and comment! And good luck! I would so love to win this book. I’m very intrigued by this technique and really like the geometry of it. The pictures look so cool, especially the linen towel. And it’s counted too! Really, I would just love to try this technique. I am always up for expanding skills and this is a technique I have been reading about recently. Would love to learn more. Thanks for the giveaway. I watched a video of how the stitch is done and am quite intriqued. I think it would look great on some linen I wove a few years ago. Diane if possible will you please give the link to the video you mentioned? Thank you.. There is a video posted right here on Needle N Thread. Oh thanks for doubling our chances. I love how white work looks but have not gotten the courage up to try it without some guidance. This looks like just the ticket! Inspiration and knowledge. I would love to own this book. I’m very attracted to white work these days. I also love the fact that this this needlework that is meant to be worn. I would love to try this technique.The designs look so delicat and do geometrical! I didn’t know that such a small island has its owm embroidery technique. I really like this technique and would love to learn it. The fact that is whitework and counted really appeals to me. I have done and enjoyed whitework but I always come back to counted. THank you very much Mary for the lovely give away..the name Sardinian knotted embroidery is completely new to me. I wonder how to get those geometrical shapes with coral stitch. And the worked motifs in the book are looking like traditional embroidery of Karnataka in India named Kasuthi Work..am very much eager to know.. I want to do at least one of every technique I can find. The texture of it is what appeals to me the most. Thanks for another opportunity to win. I would love to win this book. I have been embroidering for 65 years and would love to learn something new. The cover of the book caught my eye immediately. In the fall I will be leading our local EGA chapter on a sampler of heart stitches and motifs. One of the stitches we will review is the coral knot, and this is a lovely way to use it. I saw the heart shapes at the bottom and thought they would be a perfect small motif. This ethnic style is new to me. Thanks for offering the books. OOOOH, another wonderful whitework technique – they are so beautifully timeless. J’aimerais beaucoup gagner ce livre à rajouter dans ma collection. Nouvelle technique très intéressante. I was intrigued as soon as I saw the cover, not being familiar with this style myself. I’m really drawn in by the combination of whitework with the stark geometrical designs. I would love to win. I love the look of this embroidery, it just looks so elegant. I would love to try it. I have seen this book and was immediately drawn to the technique. I have never done any counted work, but I am excited to try. I think the thing that draws me the most is the fact it is a very traditional art form to a small specific area who’s technique in this form of embroidery appears to have remained intact over the years. I also find it interesting that the embroidery is done on on surface of the fabric only. I would love to win this book, so that I can learn this wonderful embroidery technique and explore the designs and patterns it creates. I love the elegance of this embroidery, the geometric patterns are stunning. The book gives such wonderful clear instructions that even a newbie like me would be able to follow it. I am so excited by this book, it is definitely on my wish list. I like that it is counted work and I find the geometric patterns very appealing. I like symmetry! I searched the Internet for instructions for this knotted stitch and could not find anything other than where to buy the book. I loved the decorative hem on the dress…….how sophisticated. It would may my day to win Yvette Stanton’s book. I’m a big fan of any geometric needlework, and this is a technique I’ve not seen before. I would love to give it a try and possibly incorporate it into some of my other projects. I fell in love with the Sardinian needlework after receiving your email! Didn’t know it existed. The work reminds me of what was done in the 17th century. I work with indigent artisans in Central Asia who do exquisite embroidery and would like very much to show them this work so that they can reproduce it on home decor products that my company sells. Spread the beauty! Thank you for offering the books! I have never seen this technique before and I would love to try it. I especially like how it is subtle and can be used to embellish clothing – like the blue dress. Gorgeous! Needlework has been the way women have expressed themselves through time, and preserving local techniques is like preserving local languages that are passing out of use. Through time, women’s voices have often been their needles and thread. This book presents a technique developed by a group of women as their expression , and in learning the technique to create this beautiful whitework I feel a link to them., and that I would enjoy and share the pleasure of creating something beautiful with them. I love that it looks like lace. I am a lacemaker new to embroidery, and I think this is a technique I’d like to try since it seems sort of cross-over. I like this technique just because it is beautiful. I want to learn everything I can which keeps me busy and happy. I love learning. I love counted work, and more and more am looking to go beyond cross stitch to add specialty stitches. Love the texture created by this technique and how it stands up from the linen. I love whitework and especially textured. This is new to me and I am fasinated. It’s beautiful. Thanks for sharing. I would love to have this book. I live in Portugal and i just love embroidery and i’m always looking for ways to learn new techniques. This one is particularly interesting and diferent from all the ones that i’ve known in my country. I would love this book as it would be a new technique for me. I like Mountmellick work which is whitework too though not counted embroidery, but both techniques are very textured and intriguing to work with.Counted work is so therapeutic too as in cross stitch, hardanger etc. This book would be a lovely addition to my stitching library! The combination of whitework, counted stitches and the similarity to hardanger is intriguing to try. I’m an avid hardanger stitcher so this would be a nice compliment to my work…thank you!! I’ve never heard of this style but I love the picture where it is added to clothing! I had never heard of this technique, until your review. I fell in love with it because of the elegance of whitework, but more so because it’s knotted! I love candle wicking! This embroidery is definitely more elegant and versatile. Mary, your review was so thorough that I googled more info on Yvette and she is pretty impressive herself. Winning a copy of her newest book would just be first step in adding more of Yvette books to my library. Thanks for the giveaway! i just love Sardinian knotted embroidery. when you first showed it i thought oh how elegant a piece of handwork. i have never seen this type work before but it looks old world. yet neat, clean and crisp. i am always looking for a challenge and wanting to learn something new. this might just be a wonderful summer project. thank you for the opportunity to win this book. I have never seen Sardinian knotted embroidery before, but find it absolutely beautiful!! I enjoy counted work, and find the geometrical aspect pleasing. I would love to learn this technique!! Thank you for the chance to win this book!! This intrigues me as I could see it in the Crazy Quilts that I am working on . It looks a lot like candle wicking and that is beautiful also. I had never heard of Sardinian embroidery before reading your post the other day. I love discovering those who are typical of an area of the world. Those islands which were quite isolated we’re the source of nice embroideries that differs from what we can see elsewhere. On a hicking trip to Ile de la Réunion, a few years ago I discovered the technique called ” les jours de Cilaos”, and last spring, on another hicking trip, this time on Canary Islands, I discovered the technique called Tenerife, which has similarities with the preceding one. And I am eager to learn all those wonderful style of embroidery or needlework. Sardinian seems quite different too and since ii love white work and have never done coral stitch before, I would love to do some of the projects in the book or adapt those to create something of my own. I hope I’ll be the winner this time. Thank you for your wonderfull blog and those give-away. I really hope I win this one! I am always interested in different types of embroidery and whitework techniques always intrigue me. I don’t know about bookshops in Italy but amazon.it are offering with another book on the same kind of embroidery. This last book being an Italian book. Dit boek is een droom voor mij. Zou het heeeeeel graag bezitten. Ik kijk er naar uit!! Whitework is my favorite kind of embroidery and Sardinian knotted embroidery appeals to me as it is very decorative and useful for embellishing many different items. As no hoop or frame is required, it would be ideal for travel-an added appeal. I would love to win this book. I had never heard of this technique. What appeals to me is the geometry and that it also includes counted work, which is my first love. Thanks for making us aware of this. I read your blog everyday. I love the cleanliness of this style of embroidery. It is decorative without being overly fussy. What attracted me to the Sardinian book was first and foremost it is white work. I am also very interested in ethnic patterns. This style uses only one stitch,I find this interesting. When I view books devoted to a specific local I often wonder about the women who found time in their lives to do such lovely work. This book looks very thorough and the work intriguing. At the Embroiderer’s Guild we are always on the lookout for traditional work we can do. (Mixed media is so prevalent these days!) I like the look of the knots and the clean geometric lines of the Sardinian work. There is something soothing about the repetition of the designs. I would love to learn this work in order to share it with other needleworkers. So nice of you to giveaway a copy of Sardinian knotted embroidery book. It is something new for me and I would love to learn. I would be thrilled to win this book by Yvette Stanton. Sardinian whitework is a style of embroidery I would love to try as I am really drawn to it. I love knotted embroidery. I have never seen this type before. I really would like to learn more about this type of embroidery. fabric dyeing, freeform knitting and free machine embroidery. This technique would be a great addition and a good way to keep learning. I’d be delighted to win. Two things intrigue me about Sardininan Embroidery–It’s Whitework and I’ve never seen it before!!! No matter what other embroidery I do, I always come back to whitework. It centers me. And one of the reasons I came back to embroidery is that there is always something new to learn! The white stitches are lovely giving a delicate feel. I would also like to try the stitches in color threads as well as white. Perhaps trying the stitches in BOTH Bold and delicate colors. Or, combining white, and delicate and bold colors. I like this kind of experimentation, giving a different look but also keeping within traditional stitching. This is such stunning work. The white on white is a beautiful way of showing the beauty of the stitching . the geometry of the counted stitches is so intricate. I would love to learn this technique of embellishment , if fortunate enough to win this book. I’ve become quite interested in techniques of other countries and this is a new one for me! It would be great to have an authority to learn from and try it out! Oh, I’d love to enter this giveaway, Mary, but I’m leaving Saturday morning to go on a week long holiday, and I won’t have computer access. Drat! Oh well…..such is life…….I am intrigued by this technique, especially as I love whitework and texture. Have a great week! I’ve never seen this embroidery before, but I love anything to do with hardanger, pulled thread and this looks very similar. What a great book – and what a great give away. Thanks for sharing with us. Thanks for continuing to inspire and intrigue me. This technique is new to me, but it interests me because of the texture and geometric patterning. I am a weaver and I think this form of embroidery would be a spectacular addition, perhaps stitched as a yoke across the shoulders and cuffs, of some of my fancy twill jackets. Bet you didn’t expect to hear that usage, did you? Surprising but the resulting patterns are very similar. Thanks for this chance Mary, and I will buy the book even if not selected. I’m sure you will, but please include places to purchase within the announcement of the winners. All the words that you used to describe the Serbian Knotted embroidery are exactly the things in needlework that I am drawn to. If I have seen Serbian knotted embroidery I wasn’t aware. The book looks beautiful and I’d be glad to own it…and learn from it. Sardinian knotted embroidery, intrigues me! Never seem anything like it. I love whitework, but this is counted stitches in geometric from, which I would love, because I enjoy math. Just a simple elegant. Would love to spend time with author & women that does this type of embroidery. I love all forms of counted stitch work and this is not one I am familiar with. I am sure this book is as well written and easy to work from as Yvettes’s other books. Holding thumbs. I love the texture, clean lines and precision. I can see it in the first instance on Christmas napery, but I especially like the idea of using it to embellish clothing – a white tunic would look stunning. I don’t think I’ve ever seen Sardinian embroidery in person. It looks very intriguing to learn – it looks like lace, not delicate frilly “for looking at only” lace. It looks like it could stand up to actually being used and laundered often. I also like that not a lot of special materials or tools are required. It’s fancy-work with a quiet tailored reserved style that I find myself favoring more often now. I have never seen this type of embroidery before, and would love to learn how to do it. I seem to be drawn to geometric designs. I am mainly a crazy quilter, and can see how this could be incorporated into a block with fine effect. Thank you Mary for the giveaway. I had never seen this kind of work before. I loved the picture of the Sardinian work with, what looked like, drawn thread embroidery. Would like to learn more about this and your review of the book has peaked my interest. You question answers allthe reason I am interested in this technique-that it os whitwork, textured, counted,and traditional. The traditional is probably the kisker. I like to explre the history of techniques and the people who stitched using that technique. I’m an all of the above kind of gal, but particularly love that it is counted and has texture! Thank you so much for the chance to win the book, and a very big thank you for all you share with us in your blog! I have Swedish heritage (my great grandparents came from Sweden) and am interested in all types of Swedish needlecrafts. I love the clean lines, precision and texture. I can see it making elegant Christmas napery, but I think, with practice it would look stunning on clothing – a white tunic, for example. It would be fun to learn and experiment. What a great opportunity to add a new technique. Any new stitch is a welcome item to the growing list of stitches that I have learned over the years. The designs are clean and interesting. This give-away would be a fantastic addition to my library. I have a few of Yvette’s books, they are wonderful and make it easy to learn a technique. Great giveaway. I love white work and have tried a number of techniques. The way this is stitched is interesting and inspires me to give it a try.. I also really like the lacy look of Sardinian embroidery. Thanks again, Mary! Just because it’s Italian white embroidery! Thanks for this chance, Mary and Yvette! Thank you for reviewing this book! It looks great. I really like the idea of helping to keep alive the needlework traditions of other countries and peoples. Thanks for sharing! What I especially like about Sardinian knotted embroidery is textured and geometrical look of it. It is totally new to me and what grabbed my attention was the blue on blue embroidery on the sheath dress in the review of the book. Thanks Mary for another fabulous give-away. I just saw this book and am dying to have it. The work looks so delicate and precise, and I love the look of whitework. I hope I win a copy!!! The fact that this is a counted form of embroidery intrigues me, plus I would learn and use a new stitch. A very tempting give away for me as I have had it on my Amazon wishlist for a while now! This sort of technique is definitely for me – perhaps it is the exactness that appeals and it is in some ways similar to Luzine’s schwalm work which I am busy with at the moment which I so enjoy. I do have Yvette’s other book on Portuguese Whitework which is also very good so this would be a great pairing! Many thanks for this great opportunity. I love all things knotted. I do knotted lace,french knot embroidery, a form of macrame. So I’d love to try this knotted embroidery. Hello, thank you for offering this contest. I don’t know anything about this embroidery. It would be nice to learn this new stitch. I would incorporate this stitch with my quilting. I only hope this stitch will be easy to learn. I was so intrigued by your review. I am just starting a whitework drawn sampler and it has coral knots on it. I love the texture of the Sardinian embroidery and the fact that it is an obscure technique. This book would be a thrill to own. I love doing any type of counted stitchwork. I also have recently learned the coral knot stitch so would very much like to learn how to incorporate both types of stitching into one piece. I am intrigued with the working of the pieces on white on white but would also be excited to explore the other color variations. It is a lovely book and I would be proud to own it. White on white has always been a favorite.Hankies,linens, slips,blouses, skirts, etc. Counted and drawn work as well. And here is a way to combine the two! I love it!!! I love the fact that its symetrical more than anything. It appeals to my sense of order!. The fact that its whitework is yet another bonus for me. Thank you for your giveaways. Thanks for the opportunity, Mary! What I really like about this book is that it was written by Yvette! I have her book on Hardanger, and it is excellent, so I know I will be in good hands with this one too. My interest in Sardinian embroidery is mainly for the novelty of it, as well as a growing interest in different forms of whitework. Argh! Misspelled my own name, lol! Still too early for me, I guess! I love all types of whitework, but this one is new to me. When I first saw it, I immediately thought of using it in a project for my EGA chapter. Of course, I have to learn to do it myself first! The simplicity of the stitch but the beautiful results are what attracted me to this. I love when history and technique come together. Would really love this book. Thanks for the giveaway. This book looks awesome. Love the texture of this technique and also the scale- my eyes aren’t what they used to be! I’m fairly new to embroidery but what stood out for me is that it almost looks like a piece of lace, but it’s not! It really fools your eyes! I love counted cross stitch and white work though I haven’t done much. I love that this techniques combines the two. Looks like a lot of fun to stitch! Thank you for offering this lovely giveaway. Hi Barbara, try Tombolo e Disegni , or ask your local needlework shop to get it for you from the European Distributors, Search Press. Best wishes! Sardinian embroidery is new to me. It is beautiful white-on-white embroidery worked on linen ground threads. Anything worked on linen, a natural fiber, appeals to me. Sardinian reminds me of Candlewicking using Colonial Knots, a type of embroidery that I love, and Sardinian embroidery with its geometric design is especially lovely and a technique I can’t wait to learn (counting is always fun). Thank you for offering the book give-away. I am anxious to get started and learn a new needlework skill. I love the whitework effect without the bulky look. Intriguing. I’m one of those few crazy stitchers in the world who just love knotwork and I would love to win this book to learn some new techniques. Thanks for the opportunity! I love the texture of technique. It feels very graphic to me. Also, it isn’t so feminine, it as a nice unisex feel to it. Also, I do love white work, the white on white has such a clean look to it, very pretty. My great grandmother was trained by the nuns in a convent to embroider as a young girl in Italy. Although I never had the chance to learn from her, I would love to learn now! The book review. Has me excited I have been doing a lot of Hardanger this looks similar. Can not wait to read and try this new technique . Your review makes me want to try this technique. It sounds like Yvette has covered every single aspect. She must be an embroidery scientist. My favorite things that “sell” me: history, common supplies, project diversity including garments on plain weave linen, step by step written and photo instruction, finishing. I guess she takes the fear out of trying something new because she leaves no stone unturned. If I have a question, the answer will be somewhere in the book. I enjoy many types of crafts from embroidery and sewing to knitting and tatting. This appears to be a new craft that I would enjoy and the product of this craft would fit so beautiful and easily into my other loves. Can’t you just picture this around the bodice and hem of an heirloom sewn christening gown or inset into a a beautiful white on white or colour on colour quilt! I would love the opportunity to win this book. Is it the fact that it’s counted work? That it’s whitework embroidery? That it is textured? Geometrical? New to you? Fairly obscure and you’d never seen it before, so you’re intrigued? All of the above? I like Sardinia whitework because it’s so very orderly & disciplined in the completed project. It’s totally new to me so I’m excited to try something new & can see my first project being something in a blue & white pattern on an exquisite fabric–sort of French Country in feel. It looks like a wonderful book to just enjoy reading with a cuppa! Have used the coral knot stitch in whitework embroidery but had no idea it could be used alone to make such beautiful designs. Punt `e Nu is new to me but would love to explore it — what better way than to peruse Yvette’s book. Thanks for a chance to win. The Sardinian Knotted Embroidery is lovely. I’ve never tried whitework before but love learning new techniques. The geometric patterns in this book are just begging to be stitched! The texture of the work fascinates me and I can’t wait to learn how to produce that effect! My local needlework shop just got a copy of this book and the owner was kind enough to let me look it over. I’d love to learn this technique because it’s another surface technique, different from huck weaving. Also, I love the geometry of it, and I think it would look great in different colors. I would love to win this book! Love whitework and am always looking for something new. 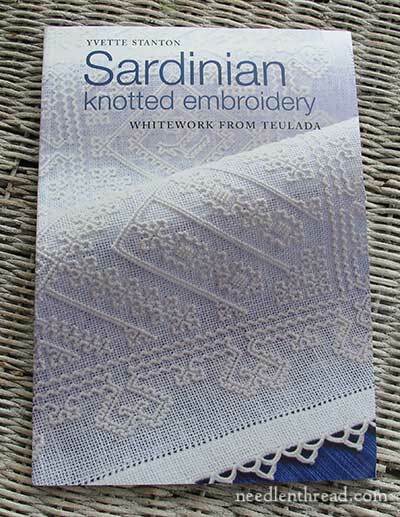 I had not heard of Sardinian whitework. With white it is the texture that makes it so beautiful. To me it takes more planning and effort to create visually artistic piece when working white on white but the finished piece is well worth the effort. I love TEXTURE in embroidery more than I do color, and the Sardinian designs are complex yet simple enough to show off the knots. Plus any book by Yvette Stanton is worth acquiring, even sight unseen. She does such a good job explaining and showing: her combination of words and drawings and photos make the techniques she presents doable. Sardinian Knotted Embroidery is a new technique to me, which I would enjoy learning. I would love to add this book to my library and use it while learning a new embroidery skill. All of the above, except for the counted part 🙂 But I’m mostly intrigued Mostly because it is whitework and new to me. all of the above – I love white work and the texture is so cool – geometrics rock. I gravitated towards geometrics and labyrinths and mazes. Beautiful things to become lost in. I have never heard of this type of needlework. I am always willing to try something new. Wow….this book/technique looks so easy and fun! I’d love to try this and win the book. What intrigues me is everything, from the type of knot, white on white, the raised look, being able to use it on clothing, materials easily available and common, and also that the needle never passes through the back of the fabric. I think the first project I’d complete would be the biscornu. This technique would also be lovely to use as a border for a frame. I’ll have to try the coral know ASAP. Thank you for another lovely review. This is a new type of embroidery to me and I am very intrigued. I love the texture of the stitches within the geometric shapes! I would so like to win this book. The white work and the edge of the blue dress is so beautiful done. I’ve never done white work embroidery, but would like to learn it with this book. And thank you so much for the things I’ve learned by looking at your website. This post introduced me to the classic and beautiful Sardinian knotted embroidery. I would love to win this book and learn how to do it. I do counted cross stitch and would love to expand my practice. I love the geometric lines, the whitework, the texture, and its obscurity. My brother is getting married next spring and I would love to embroider a tablecloth and napkins for him and his partner using this technique. I think it would make a very special and unique gift. Thanks for the contest! Any type of counted work has always seemed like a challenge to me. My having traveled in several foreign countries years ago I was able to purchase quality even count fabrics and have always enjoyed the variety of stitches one can do …with patience. The Sardinian Knotted Embroidery offers yet one more challenge and one I have tried, however feel it needs practice as well. Would love the opportunity to have this specialized book to learn more. Janet in west central Minnesota sends you thanks for the chance to win this book. Sono molto incuriosita dalla pubblicazione di questo libro visto che ho ordinato da poco su Amazon e mi arriverà a giorni un’altro libro appena pubblicato che tratta questo punto.Il titolo è: Punto annodato sardo interpretato da Gioja Ralui. E’ un punto che mi piace ma fino ad ora non trovavo pubblicazioni sull’argomento. Ora di colpo due! Lavoro parecchio ricami in bianco, a fili contati e sfilature. Ho ricamato anche molto il punto “Caterina De Medici” che come schemi un pò si assomigliano al punto annodato. Comunque ritornando al libro, vista la recensione , è ben fatto con illustrazioni chiare e vari spunti di lavoro. Seguo molto il tuo sito e anche le tue recensioni, infatti ho aggiunto alla mia biblioteca il libro sui monogrammi che hai recensito qualche settimana fà. Grazie per tutto quello che fai, sei per me una guida. I like that it’s geometric and whitework–just like stitching lace on fabric. I love that it is whitework – such a beautiful and subtle texture! I can see possibilities of combining this technique with the geometric look of a torchon bobbin lace edging. Can’t wait to try it. I am fortunate to have the leisure to stitch, discover new methods and learn for others. Now you have presented me with another method of manipulating threads (doing Snoopy happy dance). I would enjoy having a copy of the book. Hi Mary, I absolutely love the purity of the white stitching. Beautiful! I love textured whitework, and I always enjoy learning about historical needlework. I make costumes for our djembe drum ensemble, and I can see using this technique to add flair and interest to our costumes. This would help me realize my lifelong dream of being an old Italian grandmother. The technique is intriguing and I love counted and white work. I aspire to do needlework such as this. I have taught my self to do several forms of embroidery such as Hardanger and I would love to learn the many stitches of Whitework and no here is another book of inspiration and new techniques. I am always drawn to whitework and would like to try this technique on some altar linens. To answer the questions you posed in your article, yes to all of the above! I am a counted-thread stitcher; I love the way texture can make something completely white interesting and not at all blah; I was a math teacher so geometric styles appeal to me; and I had never heard of this before but it looks just beautiful. In addition, I already have several of Yvette Stanton’s other books so I know how well written they are and I would love to have this one! Sardinian knotted embroidery looks to be a very fulfilling kind of needlework. I do so love counted work! And I also love learning new techniques. Have you ever noticed how sitting down with a piece of needlework feed your soul. This kind of work is my place of piece. I would very much enjoy winning this book. It looks like challenging and fun work! I love the sharp, clean look of Sardinian knotted embroidery. The techniques is intriguing to me and I would love to learn more about it. As a student of historical stitch techniques I look forward to the exploration – to determine the rhythm of the stitch and then challenge myself to use it in contemporary pieces. This book would be a welcome addition to my studies. Thanks so much for the chance to win! One of my goals in life is to learn every kind of embroidery style that I can find. I’d never heard of Sardinian knotted Embroidery until you did the book review. I love symmetry and balance in design and this type of embroidery seems to fit that very well. I’d love to add this type of embroidery to my personal resume. I love the neatness and orderliness of it. And also I just like that it’s white-on-white; I think it’s really pretty. I would love to give this technique a try. I really like the geometry and beauty of the patterns. The fact that it can be worked in hand and with a limited color palette will also make it very portable so I could work on the piece in many locations like your Redwork Runner. This appeals to be for multiple reasons! I like whitework, I’m interested in regional styles of embroidery, and it’s always interesting to see what can be done with variations on just a few stitches. I think it would lend itself to altar linens! Thanks for the giveaway–hope I win! Mary, from the photos you have shown I have been able to see more of the patterning that is possible with the coral stitch. A month or so ago I was looking at a few embroidery books for a different stitch and settled on the coral stitch to accomplish a special effect for a class I was taking. At the time I was not aware that there might be a book out there that could have taken me even further! Different, dimensional, and lovely! My oncologist is from Sardinia and I would like to make him a token of my appreciation for all his advice and support. Thank you so much for running this give away, I am so intrigued with not just the technique itself, but the history and culture surrounding it. That in itself is a true gem! Thank you so much and good luck to all! – Karen B. Murphy in NC. The White Work book looks really interesting. I love white work so would love to try this new variation of it and winning a copy of this book would be great. Thanks for introducing this new (to me)technique. I like the white on white designs but also see a white on beige linen for added emphasis of the designs. I would love to give it a try. Thanks for the give-away! I love everything about this technique. The texture,the fact it is white work,it is counted thread work and it is something new for me to learn. I love learning new things. It is just beautiful. This technique reminds me of my Grandmother who had table linens with borders done in this style. I had asked her when I was young if she had done them and she said that they where handed down through the family. My Aunt has them now. I would like to make some to have in my house. I like counted techniques, but have never tried this one, and I’d like to try it. I also like the white on white look. I read with interest your review of Yvette Stanton’s new whitework book, Sardinian Knotted Embroidery, this needlework is new to me. I have always been fascinated with white on white needlework but have been too chicken to give it a try. It is not only beautiful, it is very classy. You have inspired me to get back to embroidery and I am proud to say my first thread painting project is almost complete with the help from your website. The only way to learn anything is to jump right in, I know I have made mistakes but I am pleased with the results for my first try. I can see a whole new area of needlework I could explore should I be lucky enough to win one of these beautiful books. Thank you for sharing your love of the needle arts, your daily messages are fun and inspirational. I love the fact that there are little to no stitches at the back. I also love the fact that it’s counted, which is rather rare for whitework. I’ve never tried whitework embroidery before, and i find this particular technique the most beautiful. I love the geometric designs and how the textured stitches just stand out from the fabric. I was hoping this book would be a give away, that’s why i didnt go right out and buy it. hope i win!!! Accidentally hit enter by mistake. Thank you and Yvette for the give-away. Hardanger was the first form of stitching that really captured me due to the relative simplicity of the stitches that could be put together in a way that looks complex, the whitework and the ease of obtaining (and maintaining) the supplies. This Sardinian whitework appears to have the same types of characteristics. Again, thank you for this opportunity. Ooooo, that is a beautiful technique. I love ethnic designs and the history behind them. And counted work is my thing. It reminds me of Schwalm (probably the white on white) which I want to learn too because of my German ancestry and that our son lives in Germany now. I am not lucky at winning things, but I’ll think good thoughts. Love to read you daily. Thank you. I would love to own this book as I have Italian connections (my husband was Italian) also my good embroidery friend, Mariana Baufeldt, is actually in Sardinia now, for a month. Punt’e Nu looks fascinating and historically interesting. It looks especially beautiful as it’s White on White and is counted.. I am so looking forward to read about and work on this technique. I’ve seen this completed years ago while on Vacation in Europe but had forgotten about this.Would love to give this a try ! I am fascinated by this very insular embroidery technique! I have been learning many different styles of historical embroidery, and this just calls to me. The geometry of the style seems to me to really lend itself to falling into the ‘zone’ when stitching that I find so restoring. Thank you for offering this give away! If I don’t win this, I’m buying it! What I love about it is that it’s something I’ve not seen before. I love doing types of needlework that aren’t done by everyone and her mother/aunt/grandmother. I also love the way such a simple stitch can make such elegant pieces. The blue on blue is just stunning. I would love to have this book, since I’m coping with unemployment by teaching myself different Italian embroidery styles. I find myself falling more and more in love with whitework, and I love that this technique has such a rich history! I can’t wait to learn more about it! I have never tried this and would love to do some. A good book would help and I know I would enjoy it. I even have some linen towels and pillow cases I could work on!!! Thanks for all your “give aways”……any reading material helps!!! I am so intriqued by this embroidery! I love the texture of the stitches, yet the orderly line work. My research and stitching has been gravitating to whitework, so this was a natural “love at first sight” book. Thank you so much for reviewing it. I’d eventually see the book, but love that you took time to let us know about it. Yvette is a wonderful author and her books are clearly illustrated and written. I hope to learn much more from this book! I love all the embroidery from this part of the world! If this is peasant work, I’m glad to be a peasant. I like the raised texture, so rich done in all white. As with Spanish Lagartera style embroidery, it is counted and confined — orderly — and yet inventive and joyful. It is put on useful things to enrich daily living. It can’t be copied by cheap overseas labor and splashed all over unsuitable items, so we craftswomen have to study and do it the old way to help keep it alive. It be a while if I have to buy the book for myself. If I win a copy, this is one I will enjoy and put to use at once! I am intrigued by the unusual aspect of the embroidery. I have never seen it before and appreciate the geometry of it. I would love to win the book! I would really love to win this book. I have done the coral knots in projects before and would love to be able to expand on what little knowledge I already have. This book would be a blessing in disguise as I am really trying to get back into more hand embroidery work. All I can say is “Pick me, Pick me” And Thank you for whetting our whistles with all that you do. I would love to get this book. I find the white on white work lovely – and would really like to explore it through a new technique that I am completely unfamiliar with. I have been trying to learn more counted techniques that rely on texture and not on color. I also think that it would make an excellent addition to the library of my local Embroiderers Guild of America library where I can share it with many other individuals!. I have never seen this before. I like the fact that it doesn’t require a hoop.I would love to try this technique. Mary, thank you so much for all your wisdom and the generosity of sharing that you do each and every day! I’ve been keeping my eye on this book, since I loved Yvette’s Portuguese Whitework book and stitched the large sampler in there, thanks to the inspiration of seeing it here on your website when you first reviewed that book. I loved whitework of all types and love geometry in my various needlework endeavors and I have to believe that there will be a number of things to try and enjoy in this new book. Many thanks for the opportunity! It would be so nice to learn a new technique but the thrill is seeing your work on a table setting. It is white, clean and just plain beautiful work. Once, while living in Virginia, my friend from Germany had a similar look on her table. She was taught needlework from childhood and then became a private duty nurse for the elderly. She would do needlework while her patients slept. Amazing how easy it was for her as an adult. The point is that Yvette is bringing this talent to a whole new generation. Wonderful. Merci et bravo Mary pour tout ce que vous réalisez pour nous. I love your tutorials and book reviews, I always learn so much & my list of new techniques to try is growing exponentially! I love the elegant look of Sardinian knotted embroidery. Thank you for the opportunity to possibly win this book. If I don’t – I’ll have to buy it for sure! Thank you & Keep educating us. I love all forms of white-work and hadn’t come across Sardinian Embroidery before. I think it would complement any other form of white-work that I decided to use in a project. I hope that I’m one of the lucky winners. Thanks. What a wonderful opportunity! Thank you to you and Yvette. I am in love with whitework, and this particular technique also adds texture. A great combination. The linear designs are beautiful and adaptable, and yet simple motifs can be created, typical of the ethnic area, or your own creations. I’d love this book so I can learn even more from Yvette’s always clear and detailed instructions. As soon as I read that Sardinian embroidery was commonly used on clothing, I was excited. I have a whole bunch of linen yardage of various colours in my sewing queue. The idea of embellishing my cuffs, collars and hems just sets my mind thrumming. I spent a summer on Sardinia 15 or so years ago. So there is a lot of personal resonance for me. I’d love to wear some history. I would love to have this book for my library. I will read it cover to cover and then put it to use in my needlework projects because I love counted work and the prospect of learning a new technique will keep me entertained. I am very interested in the fact that the work is textured on the front and yet almost unseen on the back. Back in the days of old (circa early 1980’s) I made a few pillows in candlewicking, and this Sardinian embroidery is definetely a technique I’d love to try. Although candleicking is not something I do any more, I do appreciate any embroidery, especially white-on-white embroidery, that has that delicate look to it, such as hardanger and punto antico. I hope I will be lucky enough to win one of your giveaway books and to give thus embroidery a try. I would love to win this book. I love whitework, counted work ad geometrical designs. I also love learning new techniques and had not heard of this ne before. I also like that the book gives instructions for lefthanders of which I am one. I have never been very successful at coral knots but the designs you showed in your review of this book were tantalizing. So much so, that I’m already imagining how I could use the technique that I know so little about in my own designs. Hello! I struggled and struggled with the coral knot when learning crewel embroidery and finally got to the point where it looked reasonably good in terms of spacing of the knots. It never occurred to me that it could be done on even weave fabric. Duh! What a wonderful idea! Beautiful too. I’ve never done this before but I really like the clean white look with the texture. It is beautiful! Always up to learn a new kind of embroidery. What I really enjoy is an embroidery with a history especially when it is linked to a geographic area. You can be transported to a long ago time and place while stitching and imagine yourself there. The Sardinian Knotted Embroidery is appealing because of its simple, geometric look – a great look – a new way to use thread and needle. It looks like the book combines the history, the place and the stitches to produce a beautiful ornamentation. My answer to your question is “all of the above”! Plus, it is a Yvette Stanton book, and I love all of them so far. I’m working up the courage to tackle an EGA Master Craftsman Program and exploring some of the lesser known whitework techniques. I really like the look of the Sardinian Knotted Embroidery and would love to learn more about it. I enjoy queen stitches, bullion stitches, French knots and colonial knots . . . so this would be an enjoyable adventure for me. I love Whitework. Discovering a new technique is really exciting, especially when it is both a counted thread technique and lacy as Sardinian is. I was so this attracted by this as a result of last week’s post that I went right to the vendor link to check it out. Sadly it will have to wait till September to fit into my budget, so I’d really love to win one of your copies. This book looks really intersting. I’m very interested in the texture this technique creates. I recently took a class on withdrawn thread and we used coral knots so I’m practicing. Thanks! I have more perl cotton 12 than I know what to do with! I bought it to tat with, but it’s a softer thread. I’ve finally figured out that my horde/collection of craft materials isn’t for the finished projects, but rather learning something new. This type of embroidery would fit the bill nicely. I recently joint you site, for information on embroidery, it’s been wonderful. I have a store and I’m planning to teach embroidery soon. Hola….encuentro maravilloso este bordado de Cerdeña …..me encantaría poder aprender la tecnica y así hacer las frías tardes de invierno mas entretenidas…..gracias por todas tus enseñanzas y claras explicaciones..!!! I am intrigued by how the stitching sits on top of the cloth! I am working on a project in blackwork, actually scarletwork at the moment and would like to compare. Also I’m curious about the author’s approach to documenting this traditional and distinctive technique. I would love to add it to my library! This whitework is so pretty and definitely a “take along” type project. I really enjoy the look of white on white. Thank you for all you do to advance the art of embroidery all over the world. I love the fact that this is hand work and counted. I find counted work very relaxing and the patterns and symmetry are so pleasing to the eye.The most important thing about this is that it is a tradition being kept alive. This author has some wonderful books. I love all the different types of embroidery. I love how this seems to be a cross between traditional white work and blackwork. Plus, I have a soft spot for counted work. It looks lovely! I like whitework and I have a couple of books on it, but lately I feel when I look at potential new books to add, they-while beautiful-don’t really show anything new, something the other books haven’t already shown. This looks like something I won’t find in my other books, so I’d love to try it out! I love white work, huck embroidery, and tatting. This is perfect for me. I love the intricacy of the stitching. It is absolutely stunning! oh I would love to win this book! I have seen very little of this and would so love to see more! I love the symmetry of it! Please pick me! I love the white on white with the geometric look! its so pretty! thanks! This is a whole new take on white work that I am yet to explore. I would love to win this book. Thank you . Whitework is one of my favorite types of embroidery and I am intrigued by this technique. What appeals to me most is the texture. I own several of Yvette’s books and would love to add another one. Counted thread is my favorite form of embroidery, but the purity of the white on white is what I really love! I have never seen this technique and would love to try my hand at it. It’s a beautiful book. It would be nice to learn something new. Wow, what fun this would be to try. I have never seen it before. I have many different types of embroidery stitches in my stash but this one would make a special new project. I am always looking for something different. Thanks for the opportunity to try this one. Thank you for all your ideas and suggestions, Mary. I am enjoying the Secret Garden and can’t wait to see what you do with the Hummingbirds! I’ve been interested in this style of embroidery since I saw a foreign-language blog post with some youtube videos of a woman doing redwork Sardinian knotted patterns. It would be great to have an English book. I’ll be picking it up one way or another. I am just finishing a drawn thread piece, white on white, for my niece’s bridal shower gift. I have been so content while working on this because I didn’t need a hoop. Working it in hand, it was so easy to take along with me wherever I went. That is what sold me on the Sardinian embroidery book — no hoop required. I think we all need to get out in public more with our embroidery and draw others into the magic. Having never heard of this type of embroidery, I am just waiting until I win this book to give this new-to-me technique a try. I love it when you give a review so that we can all be informed. Thanks a million times over for all that you teach and share!. Thanks for offering a book for us to win. Sardinian knotted embroidery looks divine. I love the geometric patterns, the texture of the finished product and the clean crispness of white-work… I don’t think there is anything about it I Don’t like! Please enter me in the drawing, thank you! I am in love with all white work. I have been hardanger for at least 20 years as well as pulled and drawn threads. I love the challenge that white work gives me and this book would just add to the projects that I already do. What a great give-away Thank you. I would absolutely love to own one of Yvette Stanton’s embroidery technique books. I am intrigue with the textured geometric design work. I would like to try a design in blue and white, using porcelain china as inspiration but of course I would have to learn the technique first and practise my counting! Thanks for offering this book as a give away. I’ve done a lot of counted cross stitch and love all things whitework, so this very pretty form of embroidery looks like it would be fun to try. Wow! I love knots and this would such a cool new technique to learn! Feel my fingers run thousands of small dots, a cool cloth, embroidery sardinia this reminds me of the happy days of paradise childish, this timeless beauty of the motifs, I dream a lot but this embroidery I want to convey. This is such beautiful work. I have been playing with geometric designs for a table cloth and 2 matching table runners but can’t seem to find the “right” technique/look but when you reviewed this book I knew that was what I wanted. Thank you for your wonderful site and fantastic reviews. Something new to learn how wonderful we keep being told every time we tlearn something new it keeps our brains ticking over. Thanks for such wonderful newsletters. I would love to have this book becausee this whitework is counted, textured, challenging and (Italian). It always amazes me the many different types of whitework embroidery. I first saw Sardinian knotted embroidery at a show in Italy several years ago and wanted to try it then but all the directions were in Italian. With this book in English and based upon the information in the review on illustations I would love to try this embroidery again. I love the look and would like to get back into doing more hand work. I find it very satisfying. I love white on white work and this is certainly a new one to me. Would love to learn a new technique. I am intrigued! I’m a long time lurker, I’m an avid fan and your embroidery work has inspired me to take mine to the next level. This book is especially interesting to me because I’m already absolutely in love with blackwork and the simple often geometric designs; the fact the it’s an elegant yet inexpensive way to embellish clothing is a big plus for me. From your review of the book I can see the same simple geometric type designs. I love how something so simple can be so complex and beautiful. Awe inspiring. I’m hooked, once i finish my current blackwork project I’m going to have to work on this! I absolutely love the idea of this in white work because it has such an heirloom quality to it. I love the timeless appeal and the versatility, you can literally add this beautiful technique to almost any project or garment! What’s not to love! Whitework, counted embroidery with an interesting texture. I think I will be adding this book to my wishlist! I would love the challenge of trying this new technique. I have used Yvette’s books before. Her instructions are clear and the way she sets out instructions and photos are conducive to learning a new technique. I have never heard of this type of embroidery until just recently. I want to learn more about it. Thank you for introducing another interesting technique and giving the chance for another generous giveaway. Wild thinking of using different colors as well as the elegant white on white. As always thank you for the chance to win a copy of this book. I am intrigued because I have done all types of needlework, and I have never been exposed to this. I would just like to learn more about it and certainly try it for myself. Wow! What a thrill to have a chance to win a copy of this interesting book- I love whitework and look forward to learning more about this type of work- Thanks for the opportunity! Would love to learn a new technique. I am always looking for something new and really like that it is textured and white on white. I am just a book-aholick when it is about embroidery concerning. I have never done Sardinian knotted embroidery because I discovered it from you Mary, but I really would like to know more about it. Thank you very much for the chance!! I am sure this book would be up to the standard of the other books published by this very talented needlewoman. It is great to see that the love of whitework embroidery can be extended further thanks to one lady who shares her adventures with all. I am intrigued by Sardinian Knotted embroidery as besides being a new type of embroidery for me. A type of embroidery of an island makes it more interesting for someone like me who has spent all my life in the tiny island of Malta. Ms Stanton’s work gives it an extra point on the wish list as her books are always clear and exhaustive. It would be a wish come true. I do enjoy counted work – I find it very de-stressing after a shift at work. I have been using Hardanger and cross stitch, but this looks very intriguing. I like the apparent simplicity of the look. I find that after twenty minutes (or better still, two or three hours) of stitching, that the rhythm and precision leave me in a place where I am a much better being to live with. I have never seen this technique before and I would just love to create some whitework as beautiful as the photos in the book. I also love knots so that would be an added pleasure to sew. I would love to experiment with a new to me form of whitework. I have done hardanger and Montmellic embroidery as well as whitework mongrams. This looks like lots of fun. I love the look of this work. I fell in love with lace on my recent European tour and although I have not seen Sardinian work before it reminds me of some of the lace I saw on my travels. I love whitework and especially the traditional style of it and am always interested in the history and development of any needlework style. Would love to give this a go! I love your book reviews, and this one is no exceptions. I’ve bought several books because of your reviews, and haven’t been disappointed yet! I love the look of this technique, as I’m very into white work right now. The interest in the particular piece comes from the type of thread, and the type of stitch, rather than the color. I’m looking forward to giving this technique a try! I’m new to embroidery and discovered your tutorials. You sit beside me so I can follow along on my ipad. I have been admiring white work on pinterest so when your review came out I read it and thought the book was very well done with pictures and visual instructions. I think it is very hard to purchase books online because they only show you the best pages. To have someone like yourself give us a review is very good. One think I really like about your site is you offer instructions, suggestions and lots of help without trying to sell something. It’s a new technique to me and I’d love to try it out. I have always steered clear of white work as I think my eyesight isn’t good enough, but I think I could try this. Thanks for all the wonderful stuff on your website – it’s a real treasure trove! I love, love, love the textured white work embroidery. I have never tried white work but I would love to start. I would just love a chance to look through this book. I have a few needlework books of my own, and I’ve read every embroidery and lacemaking book in every public library within driving distance! My family hails from Sicily, and Mediterranean needlework is one of my special loves. Fingers crossed! I love counted whitework in any form, and stumbled upon some articles on the web about this technique a while ago. Since then I’ve been trying to teach myself via the internet – which is OK, but Yvette’s book would make things sooooo much easier! It’s the first time that I hear about Sardinian Knotted Embroidery, therefore, I had to read your detailed review. Sardinian Knotted Embroidery: I like the fact that you don’t need a hoop, that the finish work is textured and geometrical. You mention that the instructions in the book are super clear and easy to follow and that’s what I need since I am still fairly new to embroidery and love to learn new technique. Thank you. I have not seen or heard of this kind of embroidery and enjoy learning new techniques! This is a beautiful book and I would love to explore it. I sew many of my blouses and I can see these patterns down the side of my sleeves, around the cuff – even at the top of the pocket. Thank you for your fun, interesting and informative blog. I would love to win this book. I think this would give me a new challenge with my needlework. I do red work and this would be a whole new technique and a further dimension to my current work. So many new things to try. I think the knotted embroidery looks so cool! It is textured, looks like an ancient, long-forgotten craft. I do counted cross-stitch so this would be right up my alley. Thanks for the chance to win. I really like the combination of the geometric designs with the textured stitch. The texture adds a some lovely interest without looking fussy. Thanks for introducing us to yet another type of embroidery! Thank you, Mary, for another great giveaway! I love anything Whitework, and would love to learn this new (to me) technique! Because it is counted work, whitework, textured, geometrical, new to me, fairly obscure and have never seen it, all these reasons appeal to me but most of all because no threads need to be cut as in hardanger or drawn thread. I am really anxious to give it a try. Thanks for the opportunity. I have experienced Yvette’s books and admire her scholarship, her layout (especially when Sardinian supports left handed stitchers as well) and I love the clarity of her pictures and explanations. Sardinian is new to me but I am keen to have a go now. I love white work (even if i don’t always leave it white! )but I especially enjoy structured rather than surfce embroidery (my satin stitch is wanting!) after a hard exacting day, finding it soothing and calming allowing the brain to settle and I think Sardinian will fit the bill nicely, very therapeutic. Essentially Sardinian looks great and so inviting to try. What I like about this embroidery: new to me, whitework, geometric, and the coral knots. I am a really big fan of using knots! Hoping to win. Sardinian Knotted Embroidery is something new to me. I’d love to try some of the beautiful geometric patterns in the book using both thread and beads. Most of all, now that I’ve seen the book and the coral stitch, I cannot wait to try it on a project. It would be great to get a free copy of the book so I can learn a new technique. I see beauty in repetition. It calms or paces my mind. This is such a fun technique. I love the texture and the pattern that it adds to a piece that would be otherwise plain. The patterns are to delicate and pretty! It’s interesting that most of the work is above the surface. Thanks for the giveaway and chance to give this stitching a try. Dear Mary, I listen to WRBH in New Orleans where an asian stitch was mentioned in a story (could have also been WLPB). Stitch was called “make you blind”, “make you crazy” or some such due to its small size & intricacy. Of course my interest was aroused & I turn to the expert. Have you ever heard of such or similar stitch? Any suggestions for research areas? Help will be helpful, ha! And much thanks. Another beautiful technique from Yvette, using Coral Knot Stitch. And yes, it is a counted thread technique which until reading of Yvette’s book, I had not heard of. With the help of this books detailed instructions and pictures, I know it will be an achievable technique to master. Thankyou for yet another chance to win an exciting book! I love whitework, and as an accountant, I also love geometrical shapes. And am always looking for ways to learn different techniques. I hope I win this book. I like the counted work and the geometric design. I have been involved with Brazilian Enbroidery for many years, and have done some pulled and cut work along with that. Coral stitch is one I enjoy doing in BE. Recently I have started learning Hardanger, and find that quite enjoyable, too. I think this craft would be fun to learn and use. (I refuse to be responsible for any typos caused by my cat, Bea). My favorite type of embroidery to explore are those created to accent clothing! The whitework is different than most “folk” embroidery destined for skirts or aprons. Plus the texture of the Sardinian knotted embroidery is just amazing. I love the crisp, clean precision of this Sardinian embroidery! See it as table linens, but also blouse highlights, an elegant evening purse… Thanks for making it possible for one of us to own this book! Meanwhile, it’s hard to stitch (or type) with my fingers crossed for good luck! I love everything about this embroidery and it is completely new to me. I will have to practice my coral knots though…. I own other books by Yvette and they are wonderful! Thank you for this giveaway. Great review on the book, seems like a fun project to try. I love any white on white needlework. I really like the idea of trying to use Sardinian knotted embroidery on crazy quilts. I think it could work. It really looks interesting. I am intrigued by the texture and geometric shapes. I enjoy watching patterns emerge. I was unaware of this genre of stitching. I now have it on my ‘Futures’ list. (I need to live at least another 100 years. LOL Thanks! I love ethnic embroideries and look forward to trying this raised technique. It looks like it could be adapted to more contemporary designs as well as the traditional ones in the book. I’ve said it before; I’ll say it again…I LOVE texture. I’ve been following Stanton’s progress in creating this and her other books and would love to flip through the pages at leisure. I love the geometrical patterns of the work which also look delicate. I am intrigued because I love white work and I usually do counted work so this would put the two together and allow me to learn another way to use my stitching skills. Thank you for sharing these books with us. I lover her blog and love her books. And I’d love to do this artform also. I love the ‘exactness’ and counting, no color deciphering, can do a small piece, and her clear instructions. Plus I met her b/c of YOU! I love embroidery that is ethnic. I am also comfortable with counted techniques. This looks like something I would have the courage to try without having someone to teach me. I have never heard of this kind of embroidery. I like that it is counted and doesn’t require an embroidery hoop. Being whitework you would need to bring a lot of different threads. That would make it easy to do travelling. I also like that the stitches barely show on the back of the fabric. I love the geometric patterns and how the stitches stand out from the fabric. Could make a nice pall, with a geometric cross pattern in this kind of embroidery. Would love to try it. I always love to see and learn traditional and historic embroidery forms. I am also very fond of both white work and counted work, so this is kind of win-win-win. This type of embroidery is beautiful because of the pure white and the stitch that creates a nice texture. I love whitework of all kinds but the beautiful doily really caught my eye. I love doilies and crochet them often. If I win this book that would be the project I would want to make. I’m interested in Sardinian knotted embroidery because of the knots. Most of the time, I”m trying to avoid knots in my embroidery thread. I’m intrigued by a technique that actually uses them. This is beautiful and I would love to learn more. I enjoy any kind of stitching and am always looking for ways to learn more (main reason I love Mary Corbet’s website! )I am also a bit book crazy – which is why I build more bookcases that I enjoy filling with good books! Learning about Sardinian knotted embroidery appeals to me in so many ways. I love all types of whitework, I enjoy learning new stitch techniques, I especially enjoy trying techniques from around the world, and until reading about it on your site, Mary, I’d never heard of Sardinian embroidery. Thank you for sharing this opportunity with your readers! Mary, this type of embroidery is something I think I could do, and looking at the pictures, I just want to reach out and touch the work, run my fingers across it! The white on white is just such a clean look, and that always appeals to me. I love it because it was another surface embroidery technique that I would love to try. I am always amazed at the number of embroidery techniques out there that I have never heard of. I love that it could be worked in both white work or as a tone on tone with beautiful colors. The fact that it can be worked with pearl cotton makes it that much better…easy of obtaining material. Thank you for your wonderful reviews and for opening up a world of things I would never have experienced without your push! I would love to win this book. I re ad your comprehensive review and am fascinated by this style of embroidery. I am recently retired and now have time to pursue new interests and would very much like to achieve something beautiful made in this style. I love your blog and read it daily. In all honesty I can’t say what is most intriguing about it because I have never seen it before so the answer would be more to learn something new. It is a technique I would have to study and conquer….thanks for the give away! I wasn’t familiar with this type of embroidery before, but your review won me over – the intricacy and geometric basis of the patterns appeal to my inner mathematician. I’m really interested in learning more about Sardinian embroidery and trying it out for myself. I love things that are geometric. I love textured stitching. Sardinian knotted embroidery combines both and that is just catnip to me. I love the fact that Sardinian Embroidery is a combination of white work, counted stitching and that it’s something new for me to try. I would be thrilled to win this book, thank you for the opportunity. Wow! Another give-away! You are so generous! This is the first time I have ever seen this embroidery technique and I love the lace-like effect achieved with the white on white and texture. What I like is counted thread embroidery. This stuff with the diagonal designs and the little bit that shows on the back intrigue me. I would love to have the book. I may just read and drool all over it, but I probably will make some items from it, or use one of the designs in another project. I am intrigued by it because it is whitework. I have long been interested in doing whitework. Thanks for the review of an interesting embroidery technique, and for the giveaway! What drew me to it was that it was one of Yvette’s books which are so well written and easy to follow. The designs look kind of complicated to me but I am sure it will turn out easy to follow with her instructions. I certainly would love this chance to win a book of hers. A great way to learn some new stitches with Yvette. Thank you to both of you. While my family is not from Sardinia, they are from Italy originally. I’ve been learning various forms of embroidery specific to Italy for example, Ars Panicalensis from the town of Panicale in Umbria, Italy. I am always on the lookout for old forms of Italian embroidery that are in danger of being lost. This book helps to ensure that the tradition will be carried on, and I’d like to help that goal by learning and using the technique on clothes that I design and sew. Thank you to you Mary, and to Vetty for this opportunity. I like the idea of using this to embellish clothing. It’s not wild and crazy and would look pretty without being overwhelming and could be done in any monochromatic colour scheme or even with space or over-dyed threads. The longer I think the more things I think of …… table linen, bed linen, tea towels, shirts …. still thinking. I love the idea of exploring an as yet undiscovered embroidery technique! Love the texture, texture, texture. The geometric designs, the fact that it’s a counted technique, and the lazy stitcher’s delight in only having to thread up a bunch of needles with one color make me eager to try this. Can I tip the scale in my favor? Sat. the 26th is my 70th b-day!! I would especially love to win this book since it’s from one of my favorite author of needlework books. I have all of her books but haven’t bought this one yet. I love this type of embroidery because it’s a form of whitework that I especially love. I have never heard of this technique before and I look forward to learning more and giving it a try. I like the counting aspect because it is familiar to me as a knitter. I like all needle crafts. I think I am mostly attracted to the textures one can create with layers of thread, yarns and fibres. I like mixing techniques. Thank you for sharing your talents. This technique looks absolutely incredible and the book looks very well done , I would love the opportunity the learn the technique and getting a free book would a wonderful and a perfect way to start ! I would love to try my hand at Sardinian Knotted embroidery – never heard of it before. The attraction is that it is counted. Although I love all sorts of embroidery stitches, I’ve found that counted is far more successful and satisfying, at least the result closely resembles the model! I’m in the middle of doing Liz Almond’s ‘Blackwork Journey’ that you recommended at the beginning of the year, and love every minute (reverse stitching and all). What a beautiful book, I am partial to any kind of whitework. This is so crisp and I love the texture, would love to try to make something with this technique. I am intregued (or however you spell it) by this technique – it is new to me and looks like fun! I love lace and lacy things, and this would be a great way to embellish all sorts of things. I can see it for Christmas ornaments, table runners, and grandbaby dresses! Hello, it’s Yvette here! I am having a simply lovely time reading through all these comments. It is exciting to see how many people would like to try a new technique, and maybe give whitework a go for the first time. Go for it! 🙂 And just so you know, I’m always happy to answer questions you may have when you’re working on something from any of my books. You can contact me through my website or blog. To all those who have said lovely things about my previous books, thank you so much for your kind words. It is very humbling to know that so many of you enjoy my books and find them so helpful. I’m full of gratitude to you all. I’m working on my next book already and can’t wait to share it with you in due course. Yes, it’s another whitework book, but I’m not saying what yet! When I read your review of the Sardinian Embroidery book, I was fascinated to learn about a type of embroidery I wasn’t familiar with. The book looks terrific, and I looked at Yvette’s website at length. Part of the appeal to me is that it seems manageable to learn and complete. It’s easy to transport since a hoop or frame isn’t required. I also love geometric patterns and frequently use them in needlework and coloring that I do. Thanks so much for such a detailed review – it certainly made me want to get started! It is crisp but delicate, its white, a little bit different, it could be very versatile and I love a new challenge in a new-old- technique and Yvette Stantons books are STATE of THE ART!! Many thanks Mary for the opportunity you are a treasure too! I love the look of whitework but have never had the courage to try it, so, as I find any counted thread work restful and, for me, fairly easy to get a reasonably tidy result, this would seem to be my ideal way to try whitework. Any news on the hummngbirds? Such beautiful embroidery! I love counted thread techniques, and I’d like to try this one. It would be interesting to plot out my own geometric designs for it. Mary I have tried sardinian knotted embroidery. I did not even know about it until I read your Article On it. After that I researched on it.It just so magical and wonderful to see sardirian work.I would love to learn more about it so that I can do my own project on sardirian embroidery. The stitchery floats on top of the cloth. It looks like tiny pearl droplets sitting on linen. I need this book to make hankies for everyone! I’ve been looking for a new type of lesser-known needlework that I could learn and then present a program and lead a project at my EGA chapter. I love counted work and texture so Sardinian Knotted embroidery would be perfect. Our Tucson EGA chapter has been exploring many interesting techniques this past year. This has proved to be very educational and fun. So far we’ve done small projects in Teneriffe, Battenburg Lace, and Hedebo. Sardinian embroidery looks so elegant and beautiful. I’m really looking forward to giving it a go one day. I’m really in the “all of the above”-category. It just ticks so many boxes for me: counted, white, textured, odd (intrigued), and geometrical. What grabs me about Sardinian knotted embroidery? First, I have never seen it before. Second, it is counted work. I love counted work. Third, with the whitework, it is very, very clean and pristine looking. Fourth, being a math major and striving to be a perfectionist, the conformity of the shape appeals to that side of my personality. Fifth, I was trying to do counted work last year and finally realized that I couldn’t do any handwork. I finally had to admit that I had double vision. After seeing three different opthamologists (one being a neuro opthamologist), I had surgery on both my eyes. After the surgery, I had to have prisms in my glasses and I have to use eye drops on a continual basis. I am anxious to give counted work a try again. I have tried some hand quilt piecing where the stitches will not show and am making progress. Seventh, thanks for the great giveaway. I’d love to win this for the opportunity to learn a new skill, and I love that it looks like a complex version of counted cross-stitch! I would love to have this book. I love the work that Yvette Stanton designs. She makes it so easy for lefthanded embroiders like myself to enjoy the pleasure and relaxation you get from embroidery. I have become very involved with Hardanger and would love to try another counted technique. The geometrical designs of Sardinian Knotted embroidery just stand out waiting to be embroidered and enjoyed. I just love whitework embroidery. I love that it has both clothing and home applications. I also appreciate the combination of structure and creativity that are incorporated. I had never heard of this technique before and am so glad that the time was taken to document the history, as well as the “how to” aspects of the technique. I am part of a group that meets twice a month at a museum to try whitework techniques. That is what we love to do. Sardinian knotted embroidery is new to me. It is of great interest because I like counted, geometric work. The designs are intricate and yet there is only one stitch! Would love to be the first in my group to do Sardinian knotted embroidery! Yvette Stanton’s books are always excellent too. I have a number of Yvette’s books and love them all. I suppose I’m a purist at heart and love any sort of whitework. Well done as always Yvette! What a stunning looking book. A most generous giveaway for sure. I am a big fan of whitework and the geometric design but most of all I love the look of the texture in the stitches. At some angles it looks almost beaded. I would definitely like to experiment with some Sardinian knot work embroidery. I had not seen much about it before you drew our attention to it so thank you for that. I would love to win this book, because it is about a traditional embroidery. I love to know and to learn about this. I have two other books wrote by Yvette and they are very usefull. With them I learned the Portuguese Whitework (bordado de Guimarães) and the Mountmelick Embroidery. I spent some time in a research about Portuguese embroidery (Viana do Castelo, Castelo Branco, Tibaldinho and others). I visited the Embroidery Museum in Nisa. After that I read a lot about embroidery history in England and in France. I visited the Boutis Museum, in Calvisson. Now I am begining to study the Italian Embroidery. The first was the Umbrian Embroidery. One of the most interesting find was the Punto de Catherina de Médici, wich is the same stitch called in Portugal as Ponto Formiga (Ant Stitch), used in the whitework from Guimarães and in the tipical embroidery from Caldas da Rainha. Sorry about my little english. I can read and comunicate talking, but I am not so good writing. I’m from Brazil. When I first saw the geometric designs of Sardinian knotted embroidery in your review they reminded me of mysterious ancient patterns and symbols. I like whitework of any kind but this style would look especially nice on clothing as Yvette has shown in her book. I like the raised texture with almost all the thread on the right side. Thank you for the opportunity to win one of Yvette’s fabulous books. The book looks beautiful and would add nicely to my collection of books about Italian regional embroidery. Also, my local chapter of EGA would love to share this book with me. It is White work, love that. I am very fond of whitework and would put this book to good use. I was so captivated by the work in this book – the counted technique, the texture and just the overall vintage feel took me back to my sweet little grandma’s living room where she taught me the art of embroidery, crochet and how to use her sewing machine. What precious memories! Kind of all of the above – the fact that it’s obscure makes me think it’s cool. I love the look of whitework, and the fact that it’s counted makes me think that I could actually do it (I like math / grids / geometry better than free flowing things). Oh WOW! It’s Italian! Just the thing I need to learn my Italian heritage. This beautiful technique is new to me so I would enjoy the challenge presented in learning it. I would love to win this book. Thank you for giving us stitchers a chance to win a copy. How can one resist tone on tone embroidery – and counted to boot. I’d love to learn more about this technique. I really loved your review of the book. It’s a new technique for me and so interesting. I love traditional embroidery and I like this form because of it’s texture. I like the counting side of it. The book seems like it covers so much information on the history and how to use Sardinian stitches. Thanks for the chance! It would be so lovely to win this book. When I looked at the photo’s from your review it made me think of my grandmother. Unfortunately she is not with us anymore but the memories of her is still with me. She came from Italy and was an outstanding cook. Not only did she serve up delicious meals, she knitted and crocheted sweaters and booties for all the children. I believe she must have also had the skills to do Sardinian Embroidery for she had beautiful tablecloths and doilies in whitework that looked just like the photos in the book. They always looked so elegant to me. I have been embroidering on and off since I was a little girl and would love to attempt such task as this. Even if I don’t succeed this book would be a daily reminder of what a wonderful grandmother I had. I like the fact that it is counted and geometric. I have seen it and always though it was done by machine. This style lends itself well to some projects that I plan to do for the altar area in the sanctuary at church. As a social historian, I’ve always been fascinated about other cultures, and as a museum professional, I seek to learn and preserve folk crafts in order to experience and preserve them. Yvette’s book on the Ukrainian technique was considerably simplified by her photos and instructions; so, I’d like to try the Sardinian technique, which I’d never heard of. My preference in stitching has been for small, repetitive motifs, and it looks fun! I’d like to try it and encourage others. I’ve long been attracted to the look of white work but I’ve waiting, looking around for.a technique that intrigues me. This might just do the trick! I like that it’s a form of embroidery I had been unaware of until reading your review. It would work very nicely I think in my crazy quilt projects. Thank you, as always, for your wonderful giveaways! Knotted Embroidery is stunning. I’d love to learn how it is done so beautifully. I like that it is so geometrical. It is a technique I have not tried and I’m always looking for something new to try. WOW! What’s not to love?? To receive the book as a giveaway would increase the LOVE!! I like how this counted technique results in a lacy-looking fabric without having to pull a lot of threads. It’s not a type of embroidery I’ve seen before, and that immediately makes me -need- to learn it. It doesn’t hurt at all that Yvette provides left-handed instructions. It’s an art which should not get lost. I didn’t know this style of embroidery existed. The work reminds me of some antique whitework pieces I’ve seen so I am very intrigued. I love whitework so winning a copy of this book would be a dream and so inspiring. This knotted embroidery is very pretty. I have never heard of it and as I love whitework would love to learn this technique. Thank you for the chance to win such an instructional book. I would love to win this book. I have not tried before but this time I really have to. This book fulfills so many aspects that I love. Something new, Whitework, Counted work and interesting new stitches. I thank you for all your input on your website. We are out on a limb in South Africa so I feel as if I am part of the rest of the world when I read your newsletter and get all the amazing tips and instructions. Mary, thanks for the opportunity to win this book. I have been following Yvette’s progress on it for quite some time and I am very excited that it is now available. I enjoy everything whitework and love learning new types — whether it’s a different stitch or known stitches in different arrangements. Yvette always does such an excellent job of teaching and providing projects and inspiration in her books. I hope I win! I came across Sardinian Knotted Embroidery quite some years ago (in 2005) when I attended to an embroidery review in Rimini – “Italia Invita”. Maybe you have heard about it since exhibitors from all over the world do come.Now, since some years it is held at Parma Fiere. I thoroughly enjoyed your account of this beautiful book. I love those knotted stitches! To me there is a simplistic elegance to the geometric patterns no matter how intricate. I have never tried this style of stitching and would love to learn. I am in Greece and it is so difficult to find needlework books but I can find white linen and thread! Your review, including the pictures you chose from the book, have gotten me very interested in Sardinian knotted embroidery. I am partial to highly textured stitches, but what cinched it was the photo of the tone-on-tone embellishment on the blue dress. It made me want to try something similar on a summer tunic. Thanks for highlighting this technique and for the giveaway. I am very intrigued about this stitch. It looks great and I would like to learn doing it. The use of it and the projects looks great. Very appealing – the subtlety of the patterns maybe? – also looks like something possible to do well? – our EGA chapter will be doing “ethnic” band samplers this fall, so very timely too. My mother would adore this, I’m sure! She loves needlework and is really good at it too. I love the white on white look of it. Of all you Give-Aways this is by far my favorite! I am an avid cross stitcher, drawn threader and Hardanger worker and this Scandinavian knot work reminds me of hardangar. Its so delicate and dainty looking. I would love this book so much to add to my collection of needlework books. Thank you for the chance. I love how delicate this type of embroidery looks and the geometrics…actually I have a real problem with random. I’m almost finished with the current quilt for my parents and was thinking I’d like to learn something new. This would be perfect. Another great give-a-way. Thanx Mary! This type of embroidery appeals to me so much. The simplicity and geometric patterns are perfect for sheets, table cloths etc. My husband I just bought our first house so I would love to embroider a beautiful Sardinian bed linen set for our new home! Hi Mary, I would love this book! Totally unknown technique to me, but I love the simple elegance, that it’s whitework, that it’s counted – I just really love the look! I like the lace-like look with the geometric designs and I love the whitework. But I did see a piece with blue and white that was beautiful too. Look forward to learning Sardinian embroidery. And I so enjoy learning about the history of embroidery from different countries of the world. Thank you for sharing. What a unique kind of embroidery! I’ve never seen it before so of course that makes me want to try it. All the reasons you suggested, Mary! This is a lovely strain (or should I say thread?) of needlework I can hardly wait to try. Thanks to you and your suppliers for offering these occasional give-aways. Wow, I must have this book. This book provides the reader with an immersion into the historical and cultural significance of Sardinian Embroidery. It appears that the detailed explanations and the pictures utilized to assist individuals teaching themselves Sardinian Embroidery are meant to be tips and guidelines that a person would normally receive as this technique was being passed down from one generation to the next. This book not only guarantees the survivial of this beautiful and ornate type of Embroidery. Hopefully, this book will also help to spread this technique around the world. I absolutely love white work … what’s not to love? It’s absolutely beautiful and it’s fun to do. I enjoying learning about all the ethnic variations of this wonderful work and your newest give-away looks like a great book to own. Thanks so much for this opportunity and for your inspiring daily missives. Hello Mary, I absolutely love your book reviews and this one is particularly interesting to me since white work is my all time favorite. I’ve not seen this particular kind before but like the idea it is counted and the lovely texture created is very special. The author seems to have included lovely pictures and I’m very anxious to try some of the projects she discusses. Thank you so much for the review, and generous offer of a give away : ). I read about this book a month ago, and I start to search in internet some information about this amazing simple and elegant stitch, because this kind of embroidery is new for me. I found few sites, images and videos, but I can’t be sure that they show me exact technique. And two weeks ago I found in my e-mail a newsletter from you with book review. What happiness! And I think “I’ll never have this book, but now I know how to work this kind of embroidery, I can learn myself!” – I watch your video about a coral knot. It’s so simple – counted work, one color, textured, geometric, but so beautiful. Every time when I found new for me kind of needlework, I’m very happy, because I can learn something. It is so exiting! This enchanting knotted stitchery has captured my interest. Having Yvette Stanton’s inspiring and informative book, Sardinian Knotted Embroidery, could improve my chances of success which, after viewing my first attempt, seems elusive. Thanks to Vetty Creations for their generosity. Thank you also Mary for your website! I like the clean lines of the embroidery. The geometic motifs make it abstract and simple. Few materials are required so I could start immediately. The textured effect and the fact it is whitework embroidery appeal. I like whitework for table linens. I have never seen or heard of Sardinian knotted embroidery before. I think it looks lovely, so lacy and delicate and I would love to try it. Thanks for reviewing the book and showing the pictures. This is a fascinating, new-to-me, style of needlework, and I would love to try it. I have the materials in my stash, all I need is the book to show me the how-to. I would love to win a copy of this book. I like it because it’s a white work embroidery. The geometric pattern with coral knots looks interesting.Thanks Mary and Yvette for this wonderful give-away. I am fascinated by any stitching technique that is new to me. Sometimes I simply research and admire from afar and sometimes, I simply *have* to try it myself. My latest is an online class where I will learn some fabulous drawn thread techniques that I’ve not yet tried. I love finding books with detailed explanations and good pictures and adding them to my library and this one on Sardinian knotted embroidery is one that I will have to collect. Winning would be wonderful! I would enjoy this book for the challenge of a learning a new way to stitch. The beginner project provided in the book would be fun to try this technique and a good way to start. Thanks for the great book giveaways. Sardinian knotted embroidery. The wonders of childhood: pure and essential, all-encompassing. Mother baking bread, Grandmother showing off her latest handwoven fabric and asking us who wants the first coral stitch. Winner, be warned: the moment you thread your needle, you’ll enter the enchanted world and never want to leave. Good luck! I had never heard of this type of stitching until now. I am intrigued by the knots. It looks very interesting to try, maybe a small piece to start. It looks so calming. I imagine it would be very relaxing to do. White work intrigues me, and it is cool to learn about a whole new technique I’ve never heard of! I’ve been wanting to make curtains for our front door and this technique would be perfect! Thanks for the chance.